Preferably in a big dumbass mixing bowl so that by the time you get to the bottom the milk tastes like Skittles. I have a photo of my doing precisely this. Fruity Pebbles in a massive oversized bowl and holding a soup ladle as a spoon. I'll see if I have it on the server when I get home. 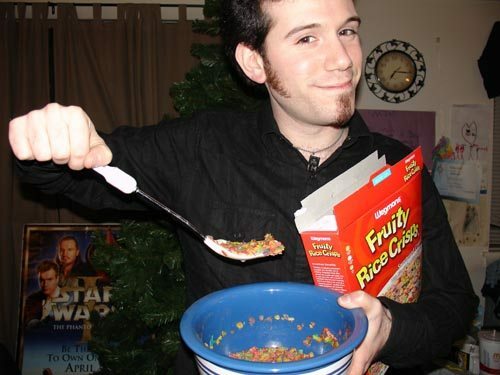 As promised - ancient photo of me (from Christmas, no less), massive serving spoon in hand, oversized bowl, and yes... Fruity Pebbles. I just tortured myself with this song in plug. I've not cried so hard in years. if you're a Cohen fan, and feel like crying your guys out quite proudly, watch this. RIP Leonard. You were a huge impact on my life and I will miss you. Too many of my musical hero's passed away this year. Why do you have an Episode 1 poster? Wasn't my house. This was 1999 at a lady friend's joint. She was a fanatic for Star Wars. Been on a crazy ol' skool hip hop kick all day for some reason. Winding it down with the sound of the Underground.